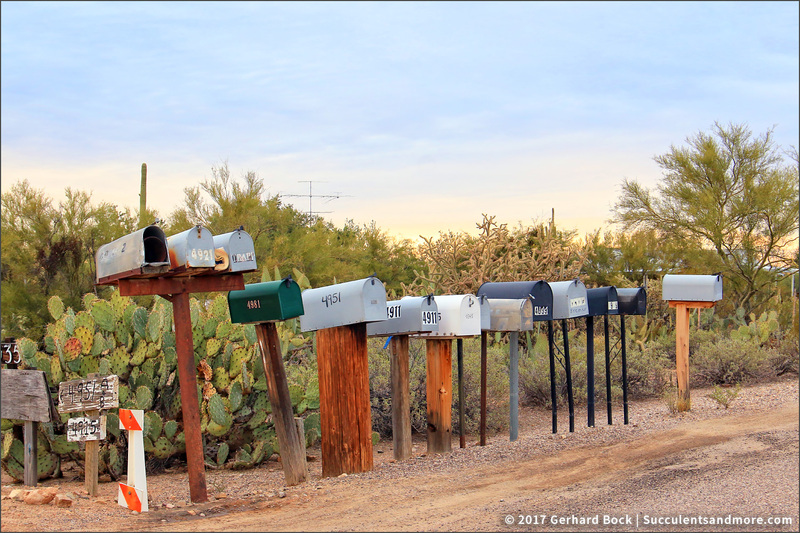 Do the prickly pears get mail too? I'm struck by the different sizes of the mailbox "poles"...4951 must be expecting some really heavy mail. See Hoov's reply. A telephone pole! Maybe the pole had always been there and the other mailboxes sprung up around it? We have a "spur road" off our street with a similar hodge-podge of mailboxes - but no Opuntia. The opuntias were the icing on the cake! Fun photo! 4951 used an old telephone pole--clever! THAT's what it is! Like Danger, I'd been wondering about the size of the post. Love this photo graph...rustic with cactus!